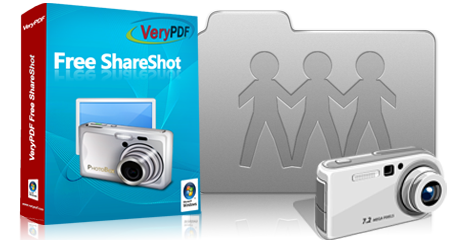 VeryPDF Free ShareShot is a free application that can capture screen and share the snapshots online. This article presents the describing of the interface of the application. 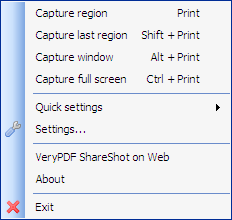 After downloading, installing and running VeryPDF Free ShareShot, its icon will appear on the system tray. Click the icon and there pops out the menu as displayed below. Capture region	. This is used for capturing a region of the screen by drawing a rectangle. Capture last region. This will recapture the same region of the screen as the last capture. Capture full screen. Capture the whole screen including anything displayed on it. Quick settings. This provides three quick setting items as shown in the following figure. Screenshot destination. Tell the application what to instantly after capture. There are six options: Share screenshot online (upload the snapshot and open the URL by a web browser); Open in image editor (edit the snapshot with embedded image editor); Copy to clipboard (copy captured image to clipboard); Save to preferred folder (directly save captured image to preferred folder); Prompt dialog to save as (save the image to other folder); and Send to printer (print the snapshot with a printer). Print options. Provides print options as snapshot below: Shrink printout to fit paper size; Enlarge printout to fit paper size; Rotate printout to page orientation; Center printout on page. Effects. 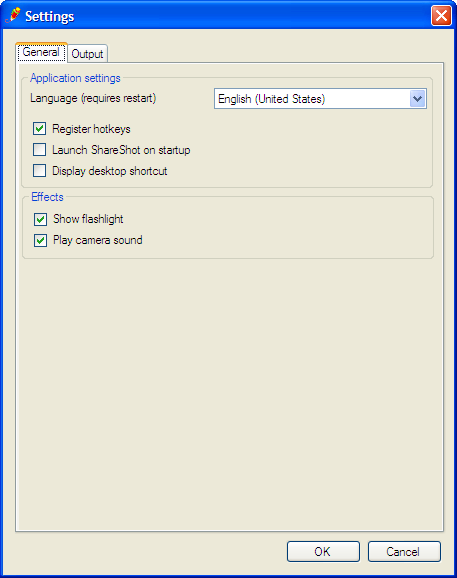 Enable or disable auditory and visual effects: Play camera sound and Show flashlight. Settings. To open the Settings dialog as displayed below. In the General tab, you can enable or disable options of Register hotkeys, Launch ShareShot on startup, Display desktop shortcut; and the Effects. 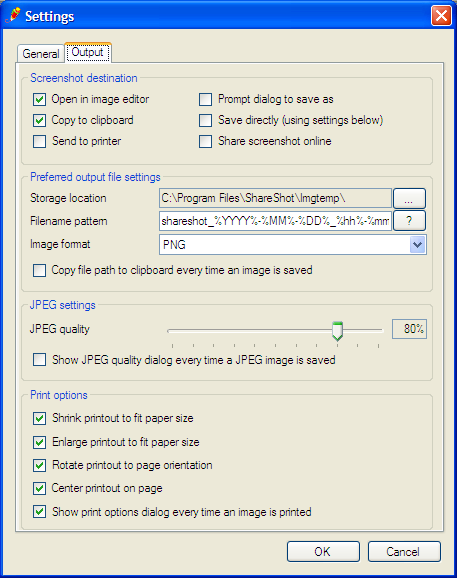 In the Output tab, you can set the options of Screenshot destination, preferred output folder, JPEG quality, and Print options. If choose to open in image editor after capture, the captured image will be loaded in the embedded image editor. Here are the instructions to the function menus of the image editor. File menu. You can Save, Save as, Copy image to clipboard and Print the captured image on this menu. Edit menu. This menu is for Cut selected element to clipboard; Copy selected element to clipboard; Paste element from clipboard and Duplicate selected element. Click Settings, you will see the Settings dialog as introduced above. Object menu. 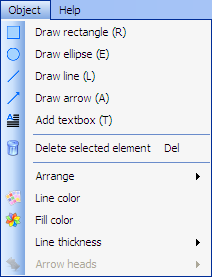 With this menu, you can draw lines, rectangles, ellipses, arrows and add textboxes in captured snapshots. The layers, color of lines, fill colors, line thickness and arrow types. Click the button Share on the toolbar to share the snapshot after editing.